This month, I have paid a lot of attention to all the Terps playing in the Euroleague Top 16. But there's another continent-wide tournament going on right now in Europe: the Eurocup. The Eurocup is the second-tier tournament in Europe, where teams qualify based on their previous season's accomplishments in their national leagues and tournaments. The Eurocup winner is invited to participate in the following year's Euroleague. This year, Nik Caner-Medley's (2002-06) team, Asefa Estudiantes of Madrid, Spain, has reached the Eurocup's Top 16 stage, where they are currently 2-0 atop Group K. Nik is averaging 11.5 points and 5.8 rebounds per game so far in the tournament. Here's Estudiantes' Eurocup club profile and Nik Caner-Medley's Eurocup player profile. Ryan Randle (2001-03) has signed in France with NM1 league team Orchesien BC (a.k.a. BCO or Orchy). Randle played well in his first game (translation), scoring 10 points. NM1 (Nationale Masculine 1) is the third-tier league in France's basketball league heirarchy, below ProA and ProB, and I think it could be called a semi-pro league. A few weeks ago, Lithuanian powerhouse Lietuvos Rytas cut ties with Sarunas Jasikevicius shortly after he led them to qualifying for the Euroleague Top 16. Sarunas moved on to Fenerbahce Ulker, another Euroleague contender from Turkey, but Lietuvos Rytas has been having trouble moving on, going through several replacements for Sarunas, but not finding the right fit. But this week, Lietuvos Rytas signed a new American guard to replace Sarunas: one DJ Strawberry (2003-07). Did you know that this young man is actually the son of former baseball player Darryl Strawberry? It's true! And all news stories about DJ are obligated to mention this little factoid! In their opening game (a loss) of the Euroleague Top 16, Strawberry had not yet joined the team in Lithuania, but Drew Nicholas scored 10 points for the winning team, Panathinaikos. Yes, Strawberry and Nicholas will be competing in the same Top 16 group of four teams. And, when his suspension is over, Juan Dixon could be back with his old team, Unicaja, in the same group. Wrapping up this week with the fourth Terp in the Euroleague Top 16, it's four-time Euroleague Champion, Sarunas Jasikevicius (1994-98). Jasikevicus helped his Lithuanian team, Lietuvos Rytas, advance to the Top 16 this year, including these video highlights of him getting a double-double in a game against his former team (and Terence Morris's current team), FC Barcelona. Jasikevicius is #22 in red and black, and Morris is #23 in... whatever the hell that color is. Click here for Jasikevicius's Euroleague stats and profile. Continuing with the Euroleague highlight videos this week, here's Terence Morris (1997-2001), playing his second season with the defending Euroleague champions, Regal FC Barcelona. In this Block of the Night, Morris (#23 in blue) bats down the ball and keeps it in bounds to his teammate, Ricky Rubio. And in this Play of the Night, Morris gets behind the defense and everybody loses track of him as he goes up for the alley-oop jam. Click here for Morris's Euroleague stats and profile. 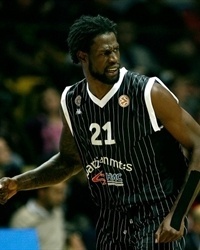 James Gist (2004-08) has been a major force playing for Partizan mt:s in Belgrade, Serbia this season in the Euroleague. Let's go to the video tape! In this highlight, Gist blocks the shot at one end, then gets the dunk on the ensuing fast break (he's #21 in blue, with the white headband). That play was good for the #1 Play of the Week that week (he also had another huge dunk at #6 in that video) and the #7 Play overall of the whole Euroleague regular season. Gist also got another Play of the Night honor for this last second lay-up to ice this game, which also featured two more high-power Gist dunks (he's #21 in white in this game). And finally, let's take this out with a Block of the Night. Click here for Gist's Euroleague stats and profile. Leading up to next week's Euroleague Top 16 round, here's a video interview with Drew Nicholas (1999-2003), who is playing his third season for Panathinaikos in Athens, Greece. In the highlight-filled video, Nicholas talks about this season's team and his role on it, the excitement of winning the Euroleague title two seasons ago, and his goals for this season (no surprise: win the championship again). Click here for Nicholas's Euroleague stats and profile. Also in Group E with Panathinaikos is Unicaja, which was Juan Dixon's team before he was suspended for steroid use last winter. He could rejoin the club after February 12. The Euroleague is an annual tournament for the top professional teams from across Europe, held concurrently with those teams' regular national league seasons. In the recently concluded Euroleague regular season, 24 teams competed in four round robin groups, with the top four in each group advancing. In the Top 16, each new group of four teams will play a round robin schedule of 6 games (each team playing the other three teams in their group home-and-home), and the top two teams in each group will advance to the quarterfinals. Games start Wednesday, January 19th. Come back daily this week for video highlights of all four Terps from the Euroleague regular season! After being cut from the Artland Dragons (translation) in Germany earlier this month, Ekene Ibekwe (2003-07) has now signed to play in Israel with Ironi Ashkelon. Ibekwe had been averaging 8.9 points and 5.7 rebounds a game in Germany. 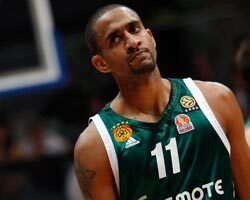 Drew Nicholas (1999-2003) and perennial powerhouse Panathinaikos advanced by winning Group D, with Nicholas averaging 8.3 points per game. Panathinaikos: How Did They Get Here? Sarunas Jasikevicius (1994-98), who was Nicholas's PAO teammate the past few years, advanced with his new Lithuanian team, Lietuvos Rytas, just barely squeaking in by winning a tie-breaker for fourth place in Group C. Saras joined the team mid-season, and if he qualified with enough playing time, would have lead the league in assists on a per-minute basis. Lietuvos Rytas: How Did They Get Here? Key play: In the penultimate game of the regular season, L. Rytas had its back to the wall facing Euroleague champ Barcelona at home and needing a win to stay alive. A brilliant Steponas Babrauskas steal and layup pushed the hosts up 13 with just under seven minutes to play, but Barca kept coming and closed the gap to a single point. Then it was Saras’s turn to deliver and he pulled up for a fearless three to make it 81-76 and restore the hosts’ confidence as L. Rytas survived a free throw battle to win 88-87. However, days after qualifying for the Top 16, Lietuvos Rytas cut Jasikevicius for salary cap space, and Sarunas quickly signed with another Top 16 qualifier, Fenerbahce Ulker. Terence Morris (1997-2001) and defending Euroleague Champions Regal FC Barcelona finished one spot above Lietuvos Rytas in the Group C standings, tied for second place (but losing a tie-breaker to fall to third). Regal FC Barcelona: How Did They Get Here? Key play: Barcelona needed to finish the regular season in style and managed to do it with a top defensive play. A layup by Rubio with 5 seconds left and a huge block by Terence Morris right at the buzzer allowed Regal FCB to register a quality home win down the stretch. James Gist (2004-08) and his new Serbian team, Partizan mt:s Belgrade, finished tied for third in Group A (but slip to fourth place on the tie-breaker). Gist was second leading rebounder in the Euroleague regular season, with 7.5 rebounds per game. Partizan: How Did They Get Here? Key play: Partizan needed a Game 9 win at home against Prokom to reach the Top 16. It all came down to the last play as Gist, who had shot 3 for 14 from the field at that point, lifted a winning layup that set Pionir Arena on fire, 61-59, with less than a second to go. Partizan had made it to the next round. The draw to determine the groups for the next phase of the tournament takes place on Tuesday, January 4th, and the next round's games begin on Wednesday, January 19th. As in past years, I'll periodically post updates on how the teams are progressing. "It was a long and difficult month in Vilnius. The team was unbalanced and I had to put in a lot of effort and concentration to do my best. Now I am heading again to the unknown, but Fenerbahce is a Final Four contender team," said Jasikevicius. The point guard has played six of Lietuvos Rytas games in the Euroleague, scoring an average of 7.3 points and 4.3 assists.